Here you are. You are making a commitment to or marrying a partner you’ve chosen to spend the rest of your life with. If you choose to purchase commitment jewelry, like an engagement ring or wedding band, the following will help you quickly select the type of jewelry metal that is best suited for you and for your lifestyle. You appreciate fine quality jewelry and want to be able to pass it on to someone from the next generation. You prefer the classic white color and are willing to spend a small premium for the noblest of all metals. Why should you buy Platinum? 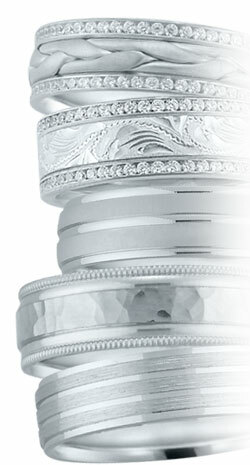 Fine Platinum jewelry is usually 95% pure, certified by the stamp - PLAT. Platinum is 100% hypoallergenic and cloud white in color so there is never a reason that it needs to be plated. 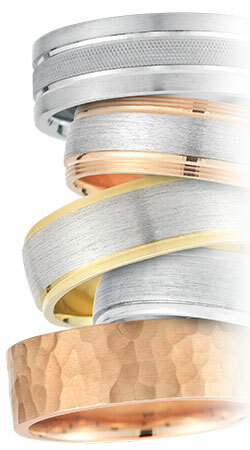 Platinum can be combined with other colors and types of precious metals so design possibilities are limitless. Platinum is considered to be the best precious metal to protect expensive diamonds. Like all precious metal, Platinum scratches. Unlike the other precious metals, when Platinum scratches, no metal is lost. Platinum doesn't wear down and get thinner and lighter in weight over time so Platinum jewelry can almost always be reconstructed by an experienced platinum craftsperson. Even a century later. Platinum has a premium intrinsic value. Strong opinions about platinum, for or against, obscure the facts and should not be relevant to your decision making. Because Platinum is such a dynamic precious metal, it isn't available everywhere, and not every jeweler is equipped or experienced enough to work on it. Beware of jewelers who advise you against Platinum. This is easily avoided by using a reputable retailer. Want to dig deeper? Ask us a question about Platinum. If you are looking for a splash of color in your jewelry than Gold is your best choice. You like the tradition of Gold, the way the word rolls off of your tongue…Gold. Gold is probably the most readily available precious metal jewelry product and smart shoppers can find good value because of abundant availability. Gold is almost always mixed with less valuable metals in order to make it harder or to change the color from its natural color, which is Gold, of course, so it lends itself to a lot of different creative applications. As a whole, the jewelry industry is probably most knowledgeable about gold and can usually be counted on to give accurate advice to consumers. More bench jewelers are experienced at working with gold than Platinum or Palladium. As one of the precious metals, Gold has a premium intrinsic value. There are so many different mixtures of gold in the different products available today it is hard to compare quality and even harder to compare value. Do not have unrealistic expectations; if you wear your Gold jewelry every day, it will wear down over time. Some Gold jewelry needs constant plating to maintain the color it is when purchased. Because there isn't one purity for Gold, it is an easy product for dishonest people to utilize in scams. Play it safe. Do not buy Gold jewelry of any type except from a reputable retailer! BUYER BEWARE! Gold plating products are often over sold and misrepresented in a way that might lead a consumer to think they are getting gold value. The truth is that the Gold on plated jewelry is worth pennies to dollars. That is because it also falls under the category - Costume Jewelry. Want to dig deeper? Ask us a question about Gold. You’re a trendsetter who wants a crisp white piece of jewelry with the always white characteristic of Platinum but a better value buy. You do the research, you researched Palladium and you get it! Why should you buy Palladium? 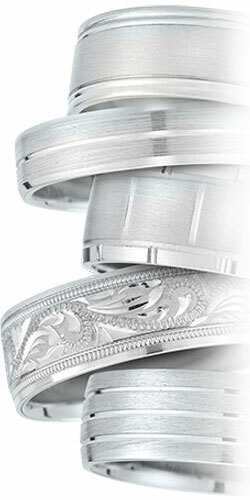 Palladium jewelry is almost always 95% palladium pure, certified by the stamp - PALL. Palladium is only available in white. Palladium can be combined with other colors and types of precious metals so design possibilities are limitless. Palladium is often referred to as Platinum’s kid sibling, without a real reputation of its own, but it is an unfair characterization. As a Precious Metal alternative to white Gold because it is really white and does not have to be plated, Palladium is often less expensive too. It has a funky stormy white sky hue and stones look great set in it. Good, honest information about Palladium jewelry can be hard to separate from the marketing done for and against it. Because Palladium is such a dynamic precious metal, it isn't available everywhere, and not every jeweler is equipped or experienced enough to work on it. This is easily remedied by using a reputable retailer that has a good Palladium supplier. Like jewelry made from Gold, Palladium scratches and wears down over time. Want to dig deeper? Ask us a question about Palladium. Silver is the most affordable of the precious metals. Larger designs and even fashion accessories like belt buckles can be produced without breaking the bank. Silver is soft and even Sterling Silver (92.5% Silver/7.5% hardening metal) will not hold up to a vigorous lifestyle unless the jewelry is made very heavy. That usually doesn't translate well into wedding and engagement jewelry. 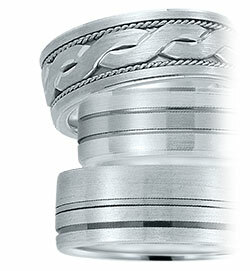 Although it can be found by a persistent customer, Silver is not readily available as wedding and engagement jewelry. Platinum and Gold have dominated this category since it became traditional. Want to dig deeper? Ask us a question about Silver.